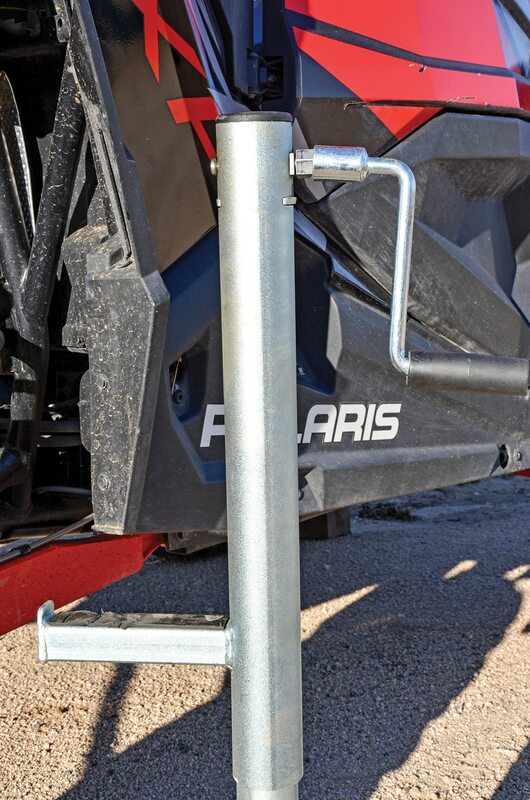 This is a screw jack capable of lifting a corner or half of your UTV up to 32 inches off the ground. It has a 2000-pound capacity and can be deployed with a hand crank or by using a socket attached to a ratchet, breaker bar or impact wrench. The 6-inch lift arm can be placed under a frame support or suspension part (your machine will vary). This jack is raised and lowered via a hand crank, or you can use a 3/4-inch socket on an impact gun or ratchet. A 6-inch-long lift tongue allows you to stick the jack under a side frame rail, suspension arm or wherever works for you. We tried the Quick Lift jack on several of our sport and utility test units. With each machine, it took a minute to find the right spot to lift from. With the machine in park or a wheel chocked, make sure the jack is straight up and down, then crank. The hand crank works quickly, and if you put the lift arm under a suspension arm, then you only have to crank a few revolutions. While the jack does go high enough to use it under the frame, you have to wait until the suspension drops out before the tires come off the ground. We always try to lift a suspension arm first, but in case of a broken part, you may need to go under the frame. This jack is capable of doing that, even on a long-travel machine. 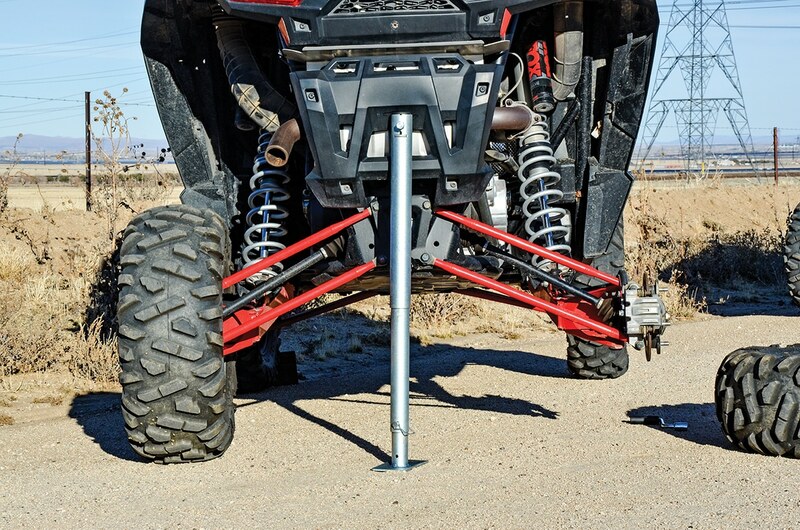 For the past couple of years, we have been thinking a trailer tongue jack would work perfectly for lifting UTVs. Hornet took our idea and made it even better by welding on the lift tongue and making it work with an electric impact wrench while still keeping it affordable. At under $110, the Hornet Quick Lift jack is about a quarter the price of similar UTV screw jacks out there. It works great and can mount using the Hornet’s mounts, hose clamps or even a heavy-duty, quick-release fire-extinguisher mount.